weber_cam: The next logical step after Twinkies ... corn dogs. 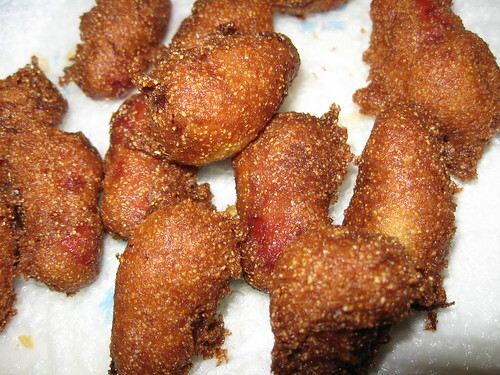 The next logical step after Twinkies ... corn dogs. Frankie's BFFF from her daycare days came over Saturday for a super play date and dinner. They both were chanting "corn dogs" and Frankie had been leading the chant for several days already. These kids were going to tear up the house worse than they already had if there were no corn dogs. Never made them before. I winged it. Bought some mini beef dogs (yum, a snack for me during prep time) and a box of Jiffy corn muffin mix. I mixed the corn muffin mix using a bit more milk than the box called for to make the batter a bit more wet, dipped the dogs in and tossed them in soy oil (ca. 365°F) and fried them about 40 seconds each. They were devoured quickly. They didn't look like the golden and thickly breaded corn dogs found at the State Fair, but they sufficed. The kids made these delicacies into a meal with Kraft Mac 'n Cheese and steamed broccoli. Yeah, haute cuisine in our home.